Animals are any of the species of organisms that are assigned to the taxonomic Kingdom Animalia, which contains groups broadly categorized as invertebrates and vertebrates. The latter contains the familiar types such as mammals, amphibians, birds, fish, and reptiles; these are the ones which include most domestic pets such as the ordinary house cat. The former, however, consists of those with or without an exoskeleton like the insects, crustaceans, jellyfish, worms, etc. All animals are heterotrophic (eat other organisms), multicellular (made of many cells), and eukaryotes (have cells with a nucleus, organelles, etc.). 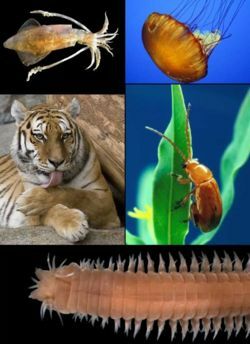 These are the principal characteristics that distinguish the animals from the other major kingdoms on Earth (plants, fungi, protists, or bacteria). The kingdom Animalia is a very diverse group anatomically, reproductively, and ecologically, and contains millions of extinct and extant species. The origin of organisms, such as the animals, is a central point of contention between the creation and evolution camps. Creationists believe that the many lifeforms on Earth are the result of an act of divine creation, whereas evolutionists hold to a naturalistic view of biological evolution and believe that all organisms share a common ancestry. The Bible states in the book of Genesis that animals were created on 2 separate days. Aquatic and flying animals were created on the fifth day, whereas the land animals were created on the sixth day. This order of events is in stark contrast to the evolutionary timeline, which states that birds and whales evolved after reptiles and mammals respectively. Phylogenetic tree of animal kingdom. 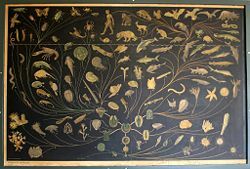 The theory of evolution proposes that biological evolution acting over long periods of time has given rise to all organisms on Earth from a single ancestral organism. It is believed that land animals evolved from ancient amphibians, which gave rise to reptiles and mammals. Some of these in turn developed into birds and aquatic mammals. This principle, known as common descent, is the cornerstone of evolution and is taught as a fact today in government schools. However, an examination of this theory will find it wanting for physical evidence. Phylogenetic trees, such as the one at right, demonstrate the absence of transitional forms, which should be found labeled at each of the branchings where the various kinds of organisms are thought to have diverged from one another. The Kingdom Animalia is a diverse group anatomically and includes varieties that are either vertebrates or invertebrates. Body shapes of animals can be either bilateral or radial, although the latter may only be found in marine invertebrates. The vertebrates are a subphylum of Animalia. As their name implies, they are distinguished by the presence of a vertebral column or backbone. The vertebrates are divided into a number of classes based largely on certain anatomical differences. Mammals - Mammals typically have fur or hair. The name mammals comes from the possession of the mammary glands used to feed infants. Reptiles - Reptiles tend to have scales. The organization of a reptile's internal organs reflects the long, narrow body structure typical of most vertebrates. Birds - Birds have feathers instead of hair, fur, or scales. Birds are also bipedal, or walk on 2 legs, and most use their two wings to fly. The body temperature of a bird is normally several degrees higher than those of mammals. Fish- Fish have scales, and live in either fresh or salt water environments. Invertebrates are characterized by the absence of a vertebral column that provides structural support in vertebrates. Many invertebrates instead secrete an exoskeleton, such the arthropods, corals, or shellfish. Many marine invertebrates rely mostly on the turgor pressure afforded by their fluid-filled bodies to keep them upright. Most invertebrates are found with the linear body structure known as bilateral symmetry, and a distinct head region (cephalization). However, some invertebrates have radial symmetry, such as the echinoderms (starfish), and cnidarians (coral, anemone). In contrast, others such as the sponges have neither symmetry, nor a head. Animals live virtually any place that we look on Earth. From the tops of mountains to the bottom of the oceans, we find animals. They have adapted to a wide variety of climates and conditions. Some animals tolerate extreme heat. Others are found in extreme cold, such as the arctic circle. Worms have even been found living in glacial ice. In addition to anatomical features, animals are classified by what they eat. There are 4 general categories for heterotrophic organisms: herbivores, carnivores, scavengers, and parasitic. Herbivores eat plants. Many herbivores obtain energy from plant matter (cellulose) by using the decomposing capabilities of bacteria or fungi (i.e. ruminants). 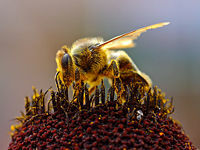 Some animals have developed symbiotic relationships with plants, such as those that pollinate in exchange for nectar or pollen. Carnivores eat other animals. Most carnivores also act as scavengers. Scavengers eat a wide variety of organic debris. Many live off dead animals; others filter-feed by consuming particulates or microorganisms they gather from the water. The earthworm actually consumes dirt. Parasites live on or in another organism. According to the Genesis account, all animals were originally created as herbivores, and it is presumed that carnivorous, scavenger, and parasitic behaviors developed due to necessity after God cursed the creation due to Adam and Eve's sin. In Deuteronomy 14:3-20 animals are defined as clean and unclean as part of the mosaic dietary law. In general, the clean animals are all obligate herbivores (eating only plants), whereas the unclean animals are either carnivores or scavengers. This may be due to the fact that carnivores and scavengers frequently carry pathogens such as parasites, which are not found in herbivores. Some scavengers also accumulate toxins to levels that are dangerous to humans. Animals come with a wide-range of capabilities for movement. Some can travel hundreds of miles in a day, whereas others remain planted to a substrate throughout their life. Most animals are mobile to some extent, and a great many of the sessile varieties have a free-swimming larval stage. Almost all animals undergo some sort of sexual reproduction. All adults are diploids, this is saying that the cells of adults contain two copies of the genetic material. The development of most animals is characterized by distinctive stages, including a zygote, a blastula, a gastrula, and the blastopore. A lot of animals also produce asexually. This may take place through parthenogenesis, where fertile eggs are produced without mating, or in some cases through fragmentation. All the species in the Kingdom Animalia develop at different rates. ↑ North Cascade Glacier Ice Worm Research Nichols College, 2007. Accessed August 27, 2008. This page was last modified on 2 February 2015, at 14:55.